Winona State University College of Business and Collider Coworking in Rochester and The Garage Cowork Space in Winona are partnering to offer the popular Business Expert Series (BES). This year’s series will give participants the option to Wade In on a topic and then take a Deep Dive to expand on the best practices and principles highlighted during the Wade In conversation. Wade In: dip your toe in a timely business topic with a 40-minute presentation and a 20-minute Q&A session that will leave you with 3-5 take-away tips to implement immediately. These intro sessions are designed to help you maximize your time with the content expert. 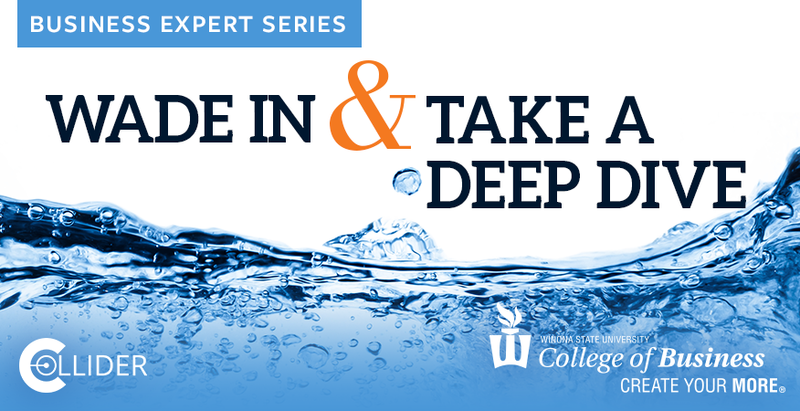 Deep Dive: immerse yourself in new ideas and strategies with a 2+ hour workshop that expands on a topic previously featured at a Wade In event. These more comprehensive learning opportunities will include the option of receiving Continuing Education Unit (CEU) documentation from Winona State.